One of our largest new additions is the rail line built from Pearson Airport (located just north west of Toronto’s city limits, in Mississauga) down to Canada’s busiest transportation hub, Union Station in downtown Toronto. The Union Pearson Express (UP for short), officially opened on June 6th, 2015 – just one month before the start of the PanAm Games. I had a flight booked out of Pearson scheduled for June 9th, so I was more than happy to try out the newest way to get to the airport. Before UP, there were a few different ways to get to Pearson. You could drive and park at the airport (for a small fortune), or at one of the Value Park and Fly lots around the airport – a little more reasonable in price, ranging from $50-$150 depending on which lot and for how long. Taxis and Limos were always a pricey option depending on where you were starting your journey from, and as a quasi budget traveller, I rarely used this option unless I was travelling with a group. Begging for a ride to the airport from friends or family is always a cheap option, however the highways around Pearson seem to have never ending traffic jams and/or construction no matter what the time of day – so unless I want to be in someone’s debt, I prefer finding my own way to and from the airport. Finally, there is the TTC (Toronto Transit Commission) option – catching the subway to the furthest west station, Kipling, then boarding the TTC Airport Rocket – all for the cost of a token, or $3 cash. I normally travel with just carry on luggage so the commute out by subway and bus is my preferred means of travel. My only complaint is that for me, the bus ride on the TTC Airport Rocket is easily one of the most nauseating experiences that make the start of any adventure a difficult one. UP promises a smooth and easy ride to the airport, so I headed down to Union Station to try it out. 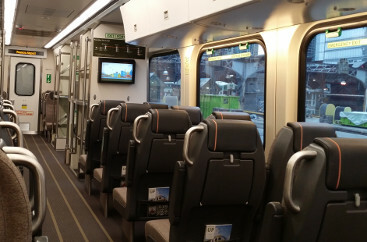 I live on the GO train line – a commuter railway that connects most of the Greater Toronto Area with Toronto’s downtown core. I have a Presto card, which gives a small discount for frequent users of the GO train, and will eventually be used in all TTC stations/buses throughout the city as an easy method of payment. I “tap on/off” at the start and end of my journey, and I can add money to the card online or at any station. I tapped on at my home station, and arrived at Union Station a short time later. Union Station has undergone a massive renovation, including a new terminal for the UP Express. The signage was still in the process of being put up, so I didn’t know exactly where to go once I had gotten off the GO train. I asked one of the GO employees if she knew which way was UP? And without blinking an eye, she pointed me in the right direction. My husband snickered beside me, at my seemingly “very directionally challenged” question, and funny enough, it was UP the stairs we had to go to find the UP terminal. The new UP terminal in Union is my definition of a perfect collection of all that I love about my city. There is a Mill Street Brewery kiosk, providing samples of their delicious beer (sadly not open at 8am). For those that prefer caffeinated beverages before noon, there is a Balzac’s coffee shop that opens at 5:30am. There is also a small version of Drake’s General Store (not the rap artist Drake, but from the old Drake Hotel – a Toronto landmark, now a trendy place to stay and party) that offers a cool selection of Canadiana gifts. You can buy tickets for the UP train at the ticket counter, or if you have a Presto Card, you can tap on/off at the Presto stand. It’s good to note that if you tap on at a train station that is not an UP terminal, you have to tap off at Union Station, then tap on again at the UP terminal. Not exactly convenient, but after a brief conversation with UP’s Customer Service Department, UP is looking into making the transition seamless. 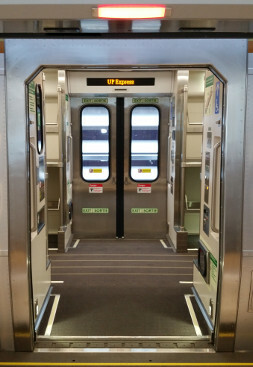 The UP Express runs every 15 minutes, and we boarded the train already waiting in the concourse. Placing our backpacks in one of the luggage racks, we chose seats that faced the direction of travel and were ready to begin our trip. Right on time, our train departed and we gracefully glided out of the station, northbound to Pearson. Travelling through graffiti covered back alleys, industrial areas, green spaces and Etobicoke neighbourhoods, our train made 2 brief stops at Bloor Street (connecting to the Dundas West Subway Station), as well as Weston (connecting to a GO train line), we arrived after exactly 25 minutes into Pearson’s UP station in Terminal 1. For those travelling out of Terminal 3, the train connecting the terminals is located right beside the UP train. We tapped off with our Presto cards, and made our way to the Departures Gate. 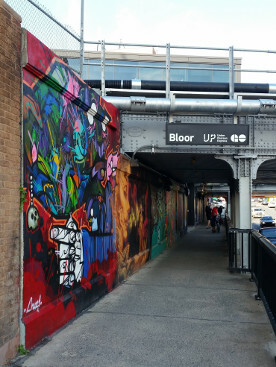 On our journey home from Pearson, we took UP again, but this time we tried connecting with the TTC subway at the Bloor Station. The two stations are not connected, and instead we had to walk a few hundred metres outside to the subway station. There is a Presto card tap on at Dundas West subway station, making it easy to just carry one card instead of subway tokens and a card as well. Overall, UP is a quick and easy way to get from the Pearson Airport to the GO train, the TTC subway line, as well as Union Station. Although cost is a deterrent, almost 7x the cost for me instead of using the TTC, the UP Express does save me time, as well as a bout of nausea when taking the bus. 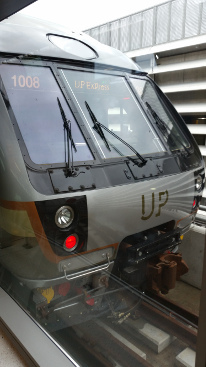 If I was visiting Toronto for the first time, I would try out the UP Express. The route is quick, easy to follow, and doesn’t require transferring from bus to subway, and then a second subway to get you downtown. I’m hoping the UP Express takes off, and the train used frequently even after the PanAm Games have left the city towards the end of summer. The cost of travelling on UP is the biggest obstacle in making UP an easy option over the TTC, however the ease and comfort getting to and from the airport makes UP a definite UPgrade in transportation options. *At the time of publishing, UP fares were $27.50 one way from Union to Pearson, and $19 one way with a Presto card.